To keep the post size down, I have picked five landscapes to showcase and discuss a little. I will be posting more on Flickr over time. 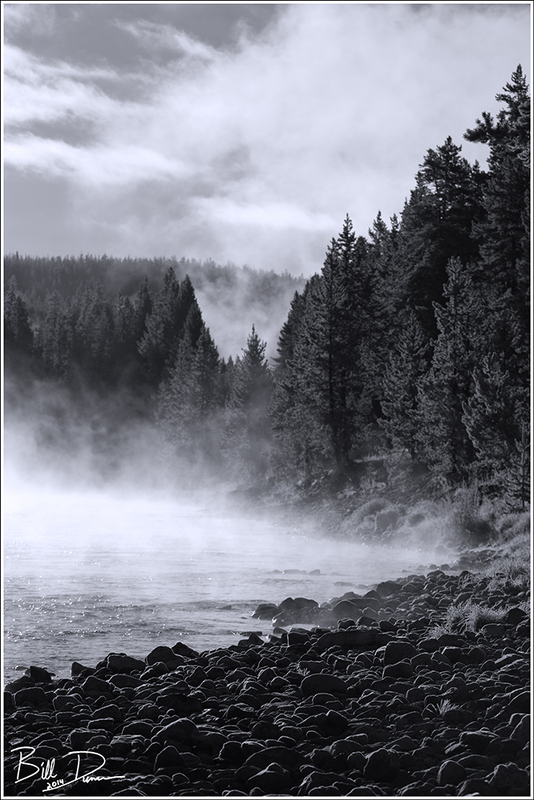 We’ll start with this one taken along the Yellowstone River on the final and coldest morning of our stay in Yellowstone. Giving Sarah a morning to sleep in a little at the Yellowstone Lake Hotel, I hit the road before sunrise with the aim of heading down Uncle Tom’s Trail to get that famous view of lower falls. Unfortunately, it soon became apparent that the cold night (~15 F in September! ), brought with it very thick fog. Even if I would have made it down the stairs that lead to the falls, I and my camera would have little to view. While walking around the parking lot, wondering where I should head to instead for my last few hours in the park, I saw from the corner of my eye what looked like a small thermal feature. This turned out to be hot air escaping from the side-wall of one of my tires. Destroyed. I knew I had about three hours before checkout, so I replaced the tire with the doughnut-spare and headed directly to the nearest service station inside the park. Along the road, I spotted this scene developing and I had to capture the fight between the fading overcast, fog and the rising sun. I dared not take the time to setup the tripod and consequently there is some lack of depth of field. But, I think things are sharp enough where they need be and it turned out to be a worthy memory of my last day in Yellowstone. Weather in Yellowtone changes quickly and frequently. We experienced almost every possible weather scenario during our few days in September. The next image was taken shortly after a small snowstorm. 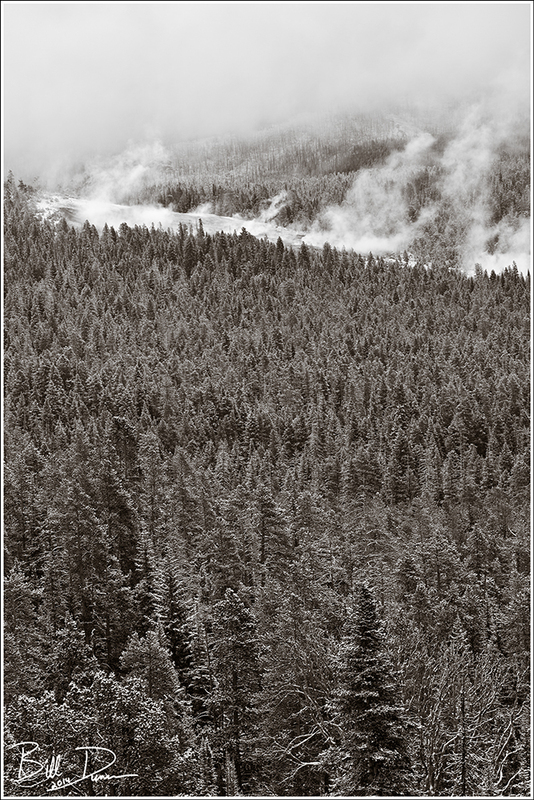 I enjoyed the texture of the snow-covered conifer forest and the steam coming off the thermal feature in the background, merging with low cloud cover. 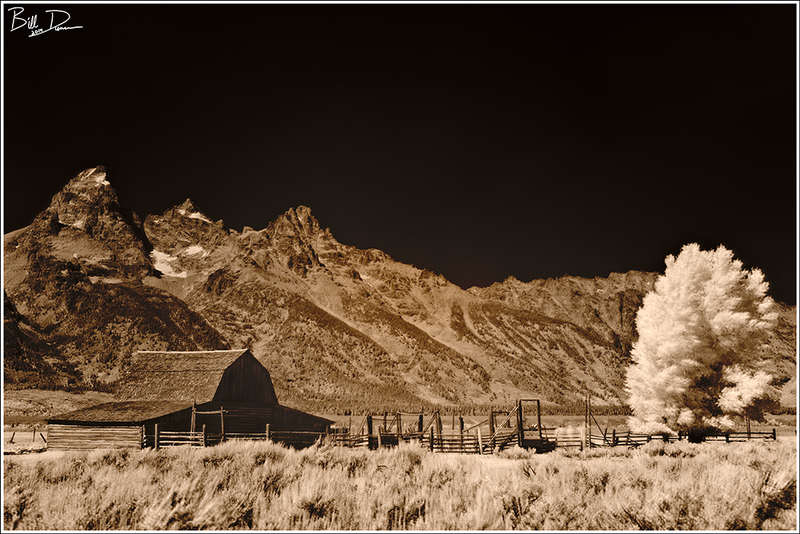 Described as the most often photographed barn on the planet, the T.A. Moulton Barn lies along “Mormon Row” just east of the Grand Tetons. Of course in the short time we were visiting there were no clouds for that interesting sky, but I made my best attempt at an “original” photograph. During our stay at GTNP, we received word of a prediction of excellent views of the Northern Lights as far south as the great plains states. Combined with predictions of clear skies during the same evening, I was definitely excited. 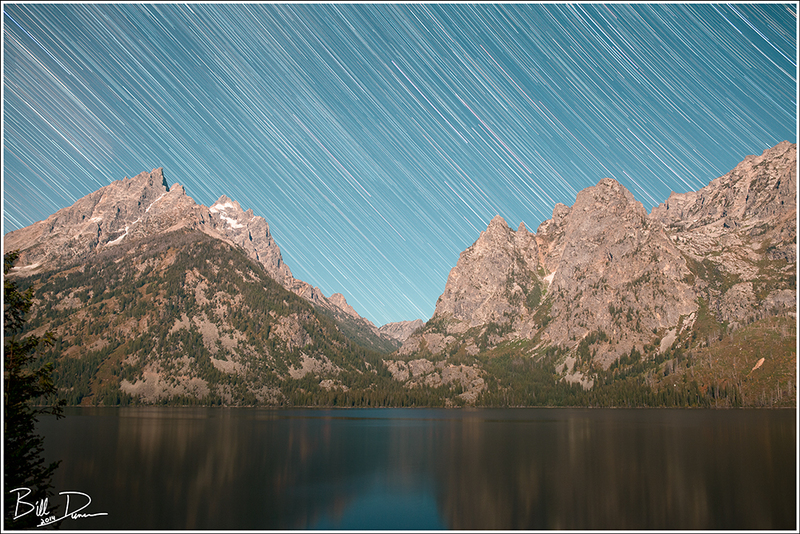 We hadn’t done enough scouting to pick the best place for setting up for astrophotography, but I did have Jenny Lake in the GPS. This would have to do. The Northern Lights never did materialize where we were located, but I made a number of shots that were later stacked in the computer for this star trails image. Before moving on to the final image in this post, I wanted to plug a great sandwich and coffee shop we found in the village of Kelly, not far from both the Tetons and the National Elk Refuge. Kelly on the Grose Ventre makes as good a cup of coffee as anywhere I’ve had. The owner/barista is a pleasure to talk with and he is truly concerned that you enjoy your drinks and food. It would be a crime to miss visiting this spot if you are in the area. 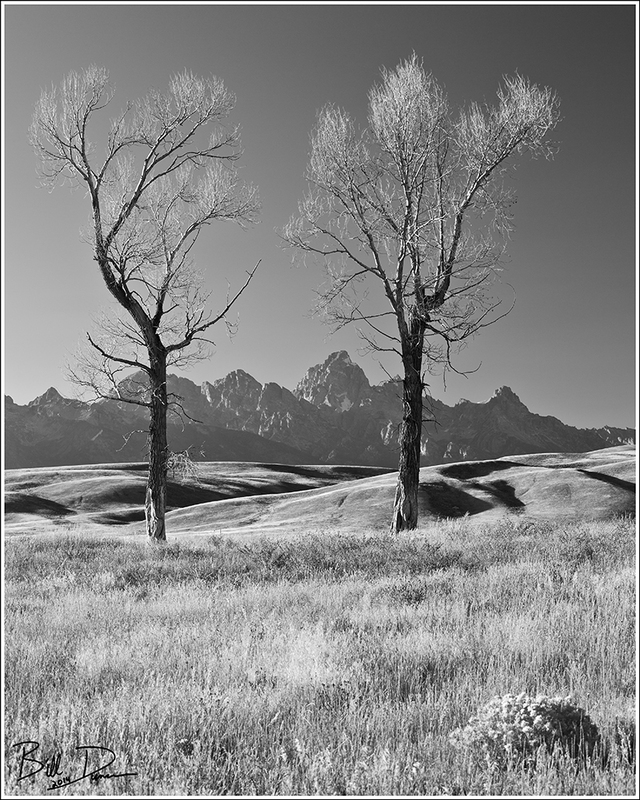 This final photograph was taken near the golden hour inside National Elk Refuge. The sun, about to drop below the Tetons, performed magic by creating nice shadows on the foothills and back-lighting the leafless pair of Cottonwoods. The National Elk Refuge has some wonderful wilderness characteristics, and I would love some more time travelling the roads and trails of this dry western landscape. I enjoyed the wry telling of your geothermal tyre 🙂 Lovely photos. What’s your flickr? Thank you, Georgina. My Flickr account can be accessed by looking at the right hand side of the blog. Ahha, thanks. I browse on a teeny tiny mobile thru wordpress. Makes sense!